We leave the U.S. on a very sad note as we lost our beloved sister-in-law Marilyn last week. Marilyn was an inspiration to all of us, from her everyday good nature and fun, to her mighty battle against cancer. She will be missed more than words can say. Nothing like hearing that your international flight is cancelled 4 hours before leaving home. We’ve worried for months that there’d be a blizzard in New England or Newark. But we didn’t anticipate snow in London! After 2 hours of frantic phone calls we got rescheduled on TWO potential flights. And bumped up a couple of hours. Our limo driver exceeded 90 mph on rt 3 (I think he enjoyed this!) but we got to the airport. And we’re on our way. Adman, our driver for the next few days, met us at Queen Alia airport with a modern and comfortable van. We’d been worried about whether he would show up so when we saw the ‘Mrs. Victoria’ sign we were relieved. I thanked and greeted all the men gathered around us before getting in the van and realizing that only one of the men was there to meet us. The others probably thought I was crazy but they seemed happy to shake hands. We headed straight to the Dead Sea- the lowest point in earth. 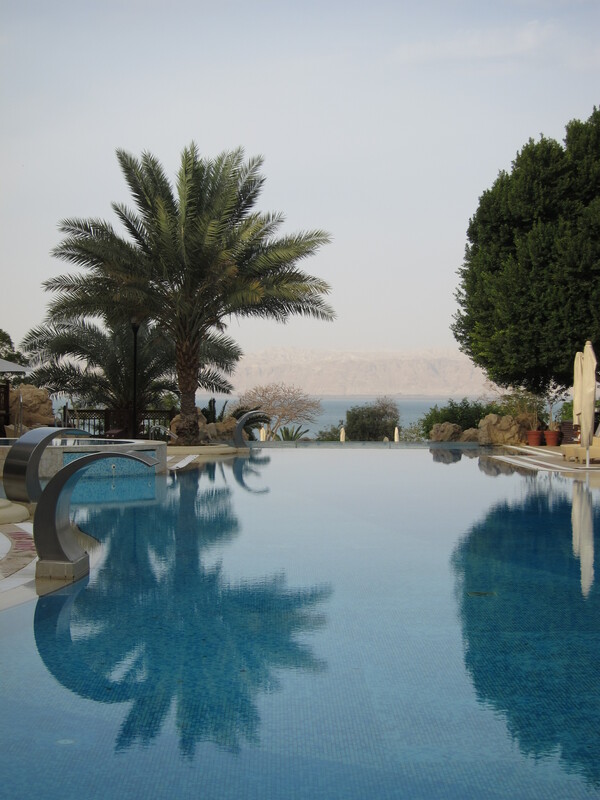 Our hotel, the Dead Sea Marriott, is beautiful! We went through strict vehicle and luggage security just to enter the grounds but once inside we were met by friendly, smiling Jordanians. They greeted us with fresh fruit juice as we checked in. After settling into our room, Dave and I took a walk down to the sea. Not much to see at night except the lights of nearby Israel across the water. We stopped for a glass of a local wine, Mt Nebo white, to celebrate our arrival in Jordan. Stop for stranded cars in the middle of Nowhere, Jordan. Believe everything you read in the guide books. What a day! We woke to a spectacular sunny day at the Dead Sea. Victoria and I took the plunge and floated in the Dead Sea. The water was warmer than the February air and we bobbed along like corks! I tried to swim but found my feet up in the air! The gardeners working nearby seemed surprised at these crazy westerners swimming in February. Our incredible guide Mahmoud met us at ten and we were off for a wall-to-wall day of history. First stop Bethany, where John the Baptist baptized Jesus. The park here doesn’t allow private guides so we joined a group and dialed in our audio tour. Across the Jordan River lies Israel with its own facility for pilgrimage. The military presence was obvious on both sides and we were told to not acknowledge anyone on the Israeli side. They were evidently told the same as we stood not more than 15 feet apart from a large group of Greek Orthodox celebrating a baptism, and no one exchanged a smile or a wave. Then on to Mt. Nebo where Moses saw the Promised Land. We were warm at Bethany below sea level and cold at Mt. Nebo with the wind blowing. Mahmoud arranged for us to visit a mosaic workshop and then brought us to lunch in Madaba. He was kind enough to order lunch for us- an authentic meal of many dishes of mezze and a lamb and chicken dish that was fantastic! After lunch we visited St George Church in Madaba which has a mosaic map of the Holy Land dating to the 6th century. A lot of driving but we were kept entertained by the camels and sheep running along the highway (and once across it into traffic!) and also Mahmoud’s fascinating stories. He is a Bedouin who has lived his whole life in Petra. He has a BA and a masters degrees in archaeology and ecology. How lucky could we get! The siq (a narrow canyon) and Treasury building were lit only by candles. The one mile walk from the entrance was a bit challenging by candlelight but when we arrived at the Treasury it was magical. It is impossible to put into words how it felt to leave the narrow walls of the Siq and enter a world out of the distant past. We strained to see the valley around us but could only see the magnificent carvings of the Treasury. We were given tea and sat quietly as two Bedouin musicians played for us. Unbelievable!!! What a day! We started early into the Siq with Mahmoud. All the things hidden on our moonlight walk became real in the day. We finally felt like we were in Jordan when we saw the Bedouin riding horses draped in colorful rug saddles, the covered carriages and the hard-working mules. Mahmoud pointed out early tombs and remarkable waterworks along the way, but stepped back to let us get the best first view of the city. Our first view of the Treasury through the Siq was breathtaking- just like Indiana Jones! Photographs do not do justice to the size of the building or the intricacies of the carvings. Mahmoud allowed us plenty of time for photos and relaxing before continuing on down the Street of Facades. The city was so much larger than we’d imagined. It’s estimated 30,000 people lived in the canyon at one time. We were giddy with relief when we arrived at the Monastery. Mahmoud showed us this spectacular building and then introduced us to some of his friends. We were served “Jordanian whiskey” aka mint tea in a cave. A cave with a TV! We chose to walk the 800 steps down and then ~3 miles out of Petra. Definitely got a workout today! Off to the Hammam – we need it!! [Three hours later] well… The Hammam left much to be desired. Funny how it was right downstairs from our tour company… What was supposed to be the ultimate in spa treatments ended up with crowded co-ed steam rooms, water being dumped on us and much more! We returned to the hotel to celebrate Bill’s birthday. The waiters serenaded Bill and we all had fun. Off to bed, another jam-packed day tomorrow! 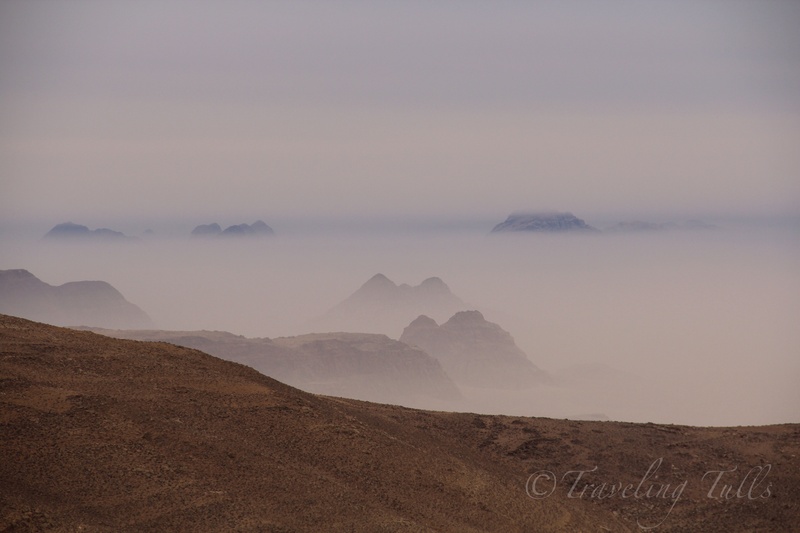 Up bright and early to make the trek to Wadi Rum. We’d originally thought we’d miss this iconic desert, a UNESCO site, but a change in our Cairo flight gave us 3 extra hours. So we drove south for 2 hours to the Wadi. This was the desert of Lawrence of Arabia. We stopped at a camp and boarded a 4×4 pick-up truck which took off into the sand. Driving on desert sand put Duxbury beach to shame! We slid down steep dunes and charged around Bedouin camps. It was so much fun. Mahmoud showed us stone etchings dated back to 800 BC. We stopped at Lawrence’s Spring where I saw a rose finch- the national bird of Jordan!! Mahmoud pointed out a sign in Arabic and whispered to me to pretend to translate it and my traveling companions were very impressed! Then back to the camp where we mounted camels for a one hour excursion. Victoria was given the lead camel and the rest of us crowded around her jostling for position. It was other-worldly to be in the wadi on camels. Absolute silence except the gentle steps of the animals. We might have been back in the age of caravans except for the camel driver’s cell phone. He spoke no English but smiled constantly, set up photo ops for us and built us a fire out of dried broom branches. We returned reluctantly to the camp, had a traditional Bedouin lunch in the tents, before beginning our 4 hour drive to the airport. Royal Jordanian was wonderful. It was only a short flight but the served us sandwiches and tea. The flight attendants wore beautifully embroidered dresses and the seats were spacious. Bring dental floss through security in Jordan. They don’t know what it is! Arrived late last night to the Four Seasons First Residence. We are joining an Abercrombie & Kent small group tour in Egypt. We can put away our maps and planners and let Abercrombie & Kent handle the details. Whew! Back at the hotel, we met our group and headed to the Giza Plateau. Everyone was very friendly and cheerful. We have an excellent guide, Hesham Abdullah, who gave us a quick history of Egypt as we meandered through very heavy traffic to the pyramids. The drive through Giza was illuminating. The revolution has left the country with an ineffective government. There has been no trash pick up in Giza for a year. Traffic laws, once lax, are now practically nonexistant. Cars going both directions drive like bumper cars down one-way streets. Outside of the city proper, hundreds of buildings are being put up on land that was farm land. The consequence of this being that Egyptians are now forced to import their wheat for the first time in history. And these buildings are of visibly shoddy construction. We could hear the sadness in Hesham’s voice as he spoke of this and about the destruction of some of his country’s treasures. Nothing on this trip has been as we’d anticipated. We were prepared for the pyramids being surrounded by parking lots and fast food restaurants. Instead we found the area- though crowded- open and desert like. Dave went inside the Great Pyramid, but the rest of us chose to wander the site and experience this last of the Seven Wonders. Some of our group rode camels and some bargained with the ever-present hawkers. ‘No’ in Arabic is ‘La’, and by the end we truly felt in La La land. Bill was offered 2 million camels for Victoria, up from the 100 the boys were offered in Jordan, but turned it down. How gallant! We visited the Solar Boat museum. A remarkable example of Egyptian art and construction AND archaeologists hard work. We gathered at 7 for cocktail hour and dinner. We have one woman from Australia and the rest from all parts of the U.S. Looks like we’ll have a great trip! We laughed all through dinner until one of the Louisiana guys brought up a character in The Help. We were all stumped with the name and ended up heading to our rooms to look it up- Celia Foote!! [Back at the hotel after a very full day of history, both ancient and currently in the making]. We left the hotel at 6:45 so we could get 2 hours at the Egyptian museum before opening time. The streets of Cairo were quieter as FrIday is the start of the weekend. 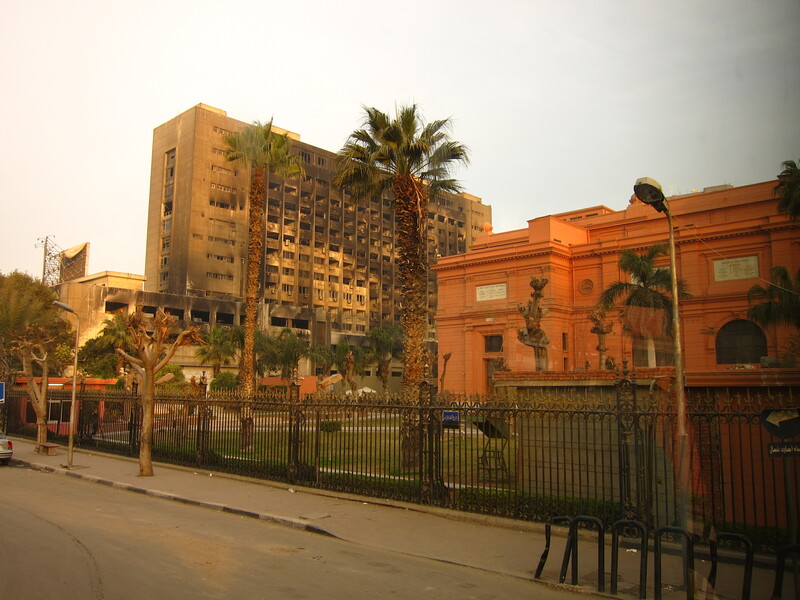 We saw the encampment at Tahrir Square as we approached the museum. Hesham told us that those camping out are not the revolutionaries of last year but criminals. Not a comforting thought. The museum was immense! Our guide was essential in getting an understanding of all we were seeing. What a privilege to see the museum without the crowds. The skills of the ancient Egyptians were amazing- statues so real you’d think they were human. We saw the oldest painting in existence, The Geese of Meidem. It could have been in a Peterson bird book! The Tutankhamen rooms were spectacular. The Royal Mummies rooms surprisingly moving and respectful. We entered in silence and all stood visibly touched afterwards. Then back in the bus to see the step pyramids of Sakkara and what remained of the ancient capital of Memphis. It was disconcerting to see so much poverty in the shadow of this once great civilization. On a much lighter note, we now know it’s possible to transport a live goat on the back of a motorcycle even through city streets! We know that Om Aly is a decadent custard bread pudding. And Victoria and I bargained with some of the hawkers, getting two $20 necklaces for $6 apiece. We have some time to ourselves now. As I write this Dave and are sitting looking over the Nile- well, I’m looking and he’s napping! We woke at 4:45 to make our 8 am flight to Aswan. Arrived in Aswan in about an hour and a half then made another short hop to Abu Simbel. An Egyptian family boarded the plane in Aswan and did a quick seat shuffle when they realized I was seated next to their teenage son. All worked out well as I had a great conversation with the mother. Very interesting to chat with a real Egyptian. She was delighted to tell me about her country and grabbed my arm to make sure I didn’t miss Abu Simbel from the air. Though lovely from the air, Abu Simbel was much more extraordinary when we finally arrived. 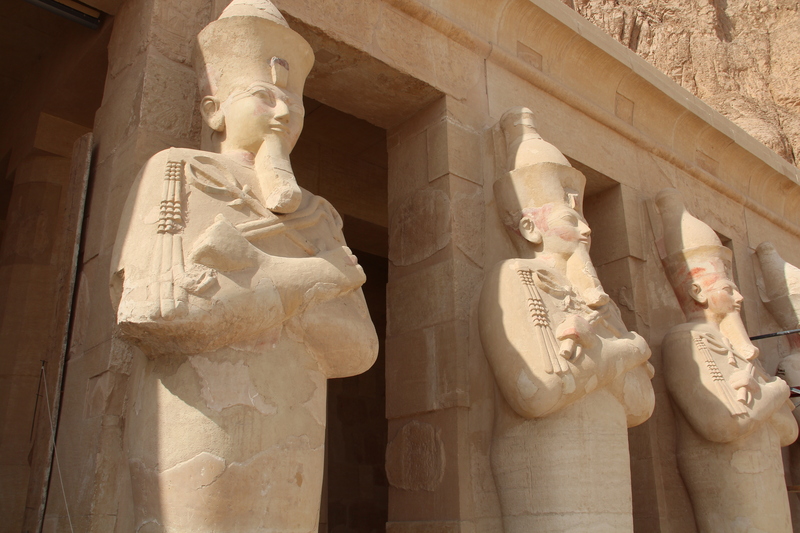 The two temples, one for Rameses II and one for his queen Nefertari were imposing yet beautiful. The setting of the temples on Lake Nassar made this site one of our favorites of the trip. Abu Simbel would have been the first thing invaders saw when approaching Egypt from the south. How intimidating to see evidence of such an advanced civilization! And how incredible that people around the world raised the money and brought in expertise to dismantle and reconstruct the temples when the waters rose after the construction of the Aswan dam. We flew back to Aswan, had a quick visit to the dam before boarding our boat. 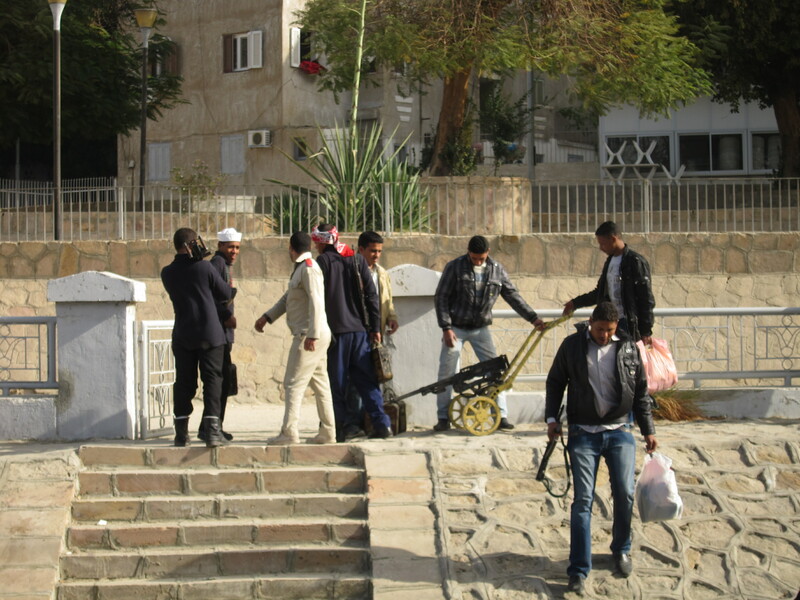 The dam is heavily guarded as it is the most vulnerable spot in Egypt. A strategic attack on the dam would flood most of the occupied land on the Nile. Our boat is beautifully decorated but economical in scale. In other words, we’re challenged to find a place for our toothbrushes! We took a felucca ride at sunset (trailed by children on improvised surfboards singing for baksheesh) then had a welcome cocktail party and a raucous dinner with the Louisiana crew! A more leisurely day today. We slept in until 7:30!! Well, we woke several times to the sounds of the Call to Prayer, very exotic to our ears. 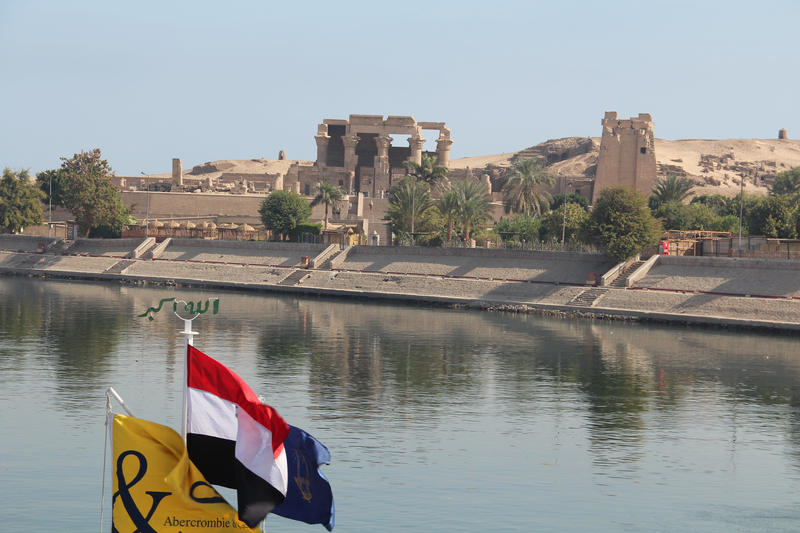 Took the bus to the dock for the boat to Philae temple. Our guide was swarmed with at least twenty people as he exited the bus and had to run away from the group. A bit disconcerting to have your guide shout “run!”… Turns out the locals were asking him to take them on our boat as it gives them the opportunity to hawk their stuff. Our guide chose an elderly man as a kindness, then bought a necklace for each of the women on the boat. The temple was beautiful. Made in Greco-roman times but in the Egyptian style. Interestingly the early Coptic Christians used it as a church, defacing some of the carvings and adding Coptic crosses to others. From there we headed to the granite quarry where the unfinished obelisk lies. I can’t get my mind around how the Egyptians could create and transport these massive stones. A stop at a bazaar and then to the boat. Time to eat!!!!!! Can’t miss a meal! We relaxed on deck before heading out late afternoon to get an impromptu tour of the First Cataract hotel, made famous by Agatha Christie. It was extraordinary; like an oasis in the desert! The staff greeted us warmly and took us all around the newly refurbished hotel. Infinity pool to spectacular dining room. Jerome and family even got to see the Royal suite -$10,000 a night! Then back on schedule, we headed to the Nubian Museum where we were on exhibit!! There was a class of teenage female art students visiting the museum and they were fascinated by us- at one point dragging me off for a photograph with the girls. The museum was very well done. The Nubian people were displaced when the Aswan dam was built. They went from living on rich farmland to being moved to the desert. A very difficult adjustment. Last stop of the day was the Aswan Spice market. A scene out of history. We were given 25 minutes to cruise the street. The shopkeepers were friendly and not nearly as obnoxious as we’d seen in other spots. Fun! Dinner onboard, now off to bed! Go to Egypt without piles of $1 bills. Woke up early as the engines roared to life to make the short trip to Kom Ombo temple. This temple was dedicated to the crocodile god, so after a tour of the temple we went to the crocodile museum. A museum filled with mummified crocodiles! Not something we see at home. The afternoon was at leisure so we sat by the pool and watched the Nile go by. In some places life on the shore looked as we’d imagine it from the time of Christ. Wheels being turned by cattle, fishermen in skiffs and goods carried on donkeys. We took horse and carriages to the Temple of Horus. We had a young man and his son for drivers. The carriages were rickety and the horses pretty sad looking. The driver begged money from us as he drove. But when we arrived at the temple it was amazing! It’s the largest and best preserved temple in Egypt. But like many other temples, it had been used as a church by the early Christians and until recently homeless Egyptians until the walls and interior of the temple as shelter. The ceilings of the temple are blackened in spots by the smoke from the cooking fires. Got home safely though not without excitement. Our horse’s harness needed adjustment (supposedly) before we left the temple and we watched anxiously as our group left us behind. Hesham told the bodyguards to wait but they waited only a minute or so and went ahead of us. So ultimately Dave and I were riding through this exotic town at night with a man asking for money. He slowed down in a dark road until I agreed to give baksheesh. When at last we saw the boat, we ran as fast as we could WITHOUT giving money. Didn’t even buy the souvenir photo. Take a carriage ride without making sure you keep bodyguards in sight! An early morning tour of the Esna temple of Khnum, built during the reign of the Roman Emperor Claudius. We were able to walk to this temple from the ship. When we arrived at the site we found the temple about 36 feet below present day ground level. Years of Nile flooding and silt accumulation have raised the town high above the temple. Each temple has something extraordinary about it. All of us are getting tired, or maybe it was the late night last night when we dressed in Galabeyas and danced all night. Anyway, most of us napped on deck as we cruised to Luxor. Or we napped after we cleared the lock in Esna. This was interesting from an engineering viewpoint but even more for the crazy people who followed the boat throwing scarfs and Galabeyas up onto our deck with the hope that we’d throw back money!!! At one point we had a man in a row boat squeezed between two cruise boats in the lock! No sooner had we docked in Luxor than our next tour began. Off to the Luxor museum and Karnak temple. The museum was beautifully laid out with some remarkable statues and artwork. 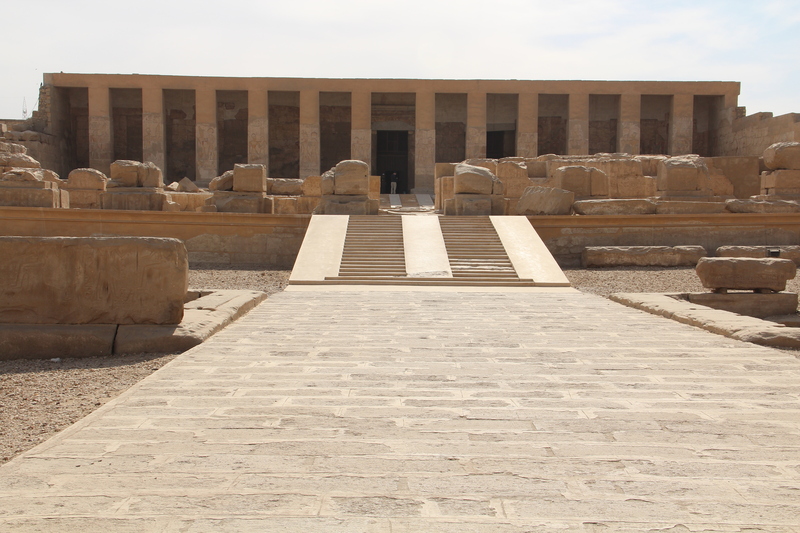 The Karnak temple is the largest in Egypt and we felt it as we trudged along in the heat. Again, extraordinary construction but we’re all getting a little weary. Very happy to see the bus at the end of the tour! Back on the ship now looking forward to our next meal. We have had fantastic meals on board. Lunch is the biggest meal, sometimes served on deck. Dinner is ordered off the menu and breakfast served as a buffet. Red roses for all the ladies tonight! We sat with Glenna and Gerard from Alabama. They met in 4th grade and are still happy at the age of 72. Great stories for Valentine’s Day! Early day tomorrow!! Valley of the Kings! Started bright and early motoring across the Nile to board our bus to the Valley of the Kings. It was hotter than we’d expected- almost 90 degrees today. But just amazing to drive into the dry, grey mountains. We saw Howard Carter’s house high on one hill before arriving at the parking lot. No cameras allowed at either tomb site so I’ll have to rely on words -completely inadequate. Our first stop was to Rameses IV tomb. We entered a wide corridor alive with color. The wall were painted white and the hieroglyphs retained reds, oranges and blues. Next was Rameses IX. The colors here were more faded due to flash flooding and years of being open to the air. But the tomb was huge – room after room burrowing deep into the mountain. Next, Tutankhamen’s tomb which was very small as he’d died so young. The pharaohs began preparing their tombs as soon as their reign began, but would have to be buried exactly 70 days after death. The mummy of Tutankhamen rests in his tomb, unlike all the other kings and queens. One more tomb (Rameses III) before driving to the Valley of the Queens. We entered the tomb to a display of extraordinary artwork. The paintings were finely done and the colors as vivid as if they’d been done this week. The ceiling was blue with gold stars. We toured the tomb in silence, all taken aback by the beauty of the artwork and the evidence of the devotion of Rameses 2 to his queen Nefertari. On to an alabaster workshop along with the requisite gift shop. Outside the shop sat four artisans demonstrating their craft. The interesting thing was that when their bosses were out of sight they dropped their tools and offered us ‘gifts’ of alabaster stones. Just a gift of course though ‘a very little money’ would be appreciated! Their bosses reappeared and they were back at work! Last stop on this extraordinary day was the female King Hatshepsut’s temple. Her stepson Thutmose hated Hatshepsut, as she’d originally served as Regent when he was a small child with the expectation that he’d become pharaoh when he reached adulthood, but she was a powerful woman and retained the crown. Thutmose did all he could to obliterate all statues and cartouches of this female King, but her statues, obelisks and temples remain. I made a ‘friend’ of one of the hawkers as I tried to convince him I spoke no English, only German. Unfortunately he spoke German fluently so he jumped on board our shuttle and followed me throughout our tour. Cal from Louisiana has begun speaking Klingon to the crowds. Good idea. A relaxing day of cruising the Nile before an afternoon excursion to AbydosTemple. We left the boat in a convoy. Hesham assured us it was not because of any safety concern and then pretended to run to the back of the bus. All along our one hour drive we saw nothing but smiling and waving kids. (not sure when/if they go to school!) Abydos is not often visited by tourists so we were a novelty. The drive itself was interesting… Lines in the road are apparently only a suggestion. Cars passed on the right and the left, donkeys pulled carts and children scurried among the moving and honking traffic. We barely missed tractors pulling carts overloaded with sugar cane. Arrived at the temple and bunched together to avoid the usual hawkers. We’ve learned that a group is best to avoid the hassling. Sometimes you have to weave in and out of the group to try to lose a persistent one. 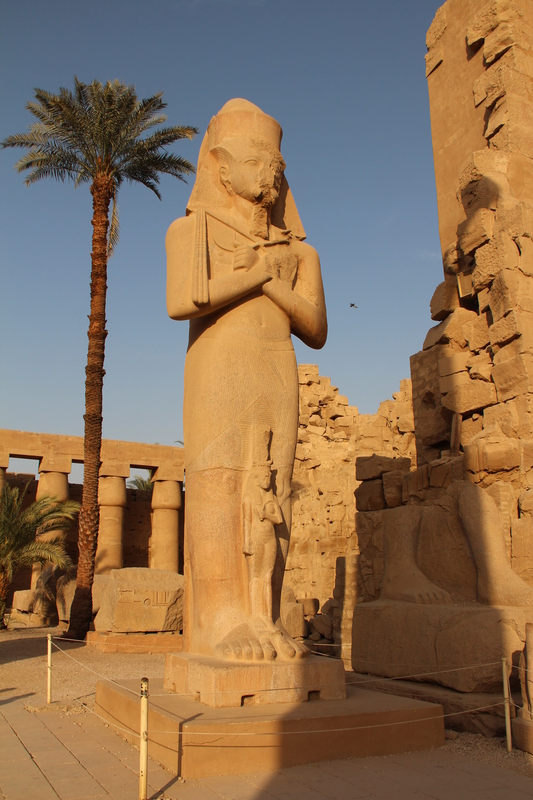 The temple was built by Seti and his son Rameses II. Here we found the chronology of all the kings of Egypt – with a notable exceptions of Hatshepsut, the female pharaoh, and Ahkenhaten, the pharaoh who tried to establish a one God religion. This area of Egypt- what we’d think of as Southern Egypt- is Upper Egypt as the Nile flows from South to North. The people here are very conservative in dress and customs. Arranged marriages, etc., are the norm. Interesting morning in Qena. This was election day in the province and the decision was between two warring families so we were delayed leaving for the temple. The general of the army refused us permission to leave the ship but ultimately allowed us to head off with a convoy of police and army escorts. All heavily armed. We were all quite anxious about this excursion. The streets were eerily quiet but once on the bus Jerome stole the mike and entertained us with tour guide impressions. What’s on the right? “banana” and on the left? “no banana” what kind of stone is that? “rolling stone.” Exactly the humor we needed to break the tension. We’d all been willing to skip the temple in light of the security situation, but when we arrived we agreed it was spectacular. Probably my favorite of the trip! (every temple and tomb was Hesham’s favorite!! Ha ha! This became a running joke with the group.) We were able to climb to the top of the temple and crawl into the crypt. The artwork was unbelievable. 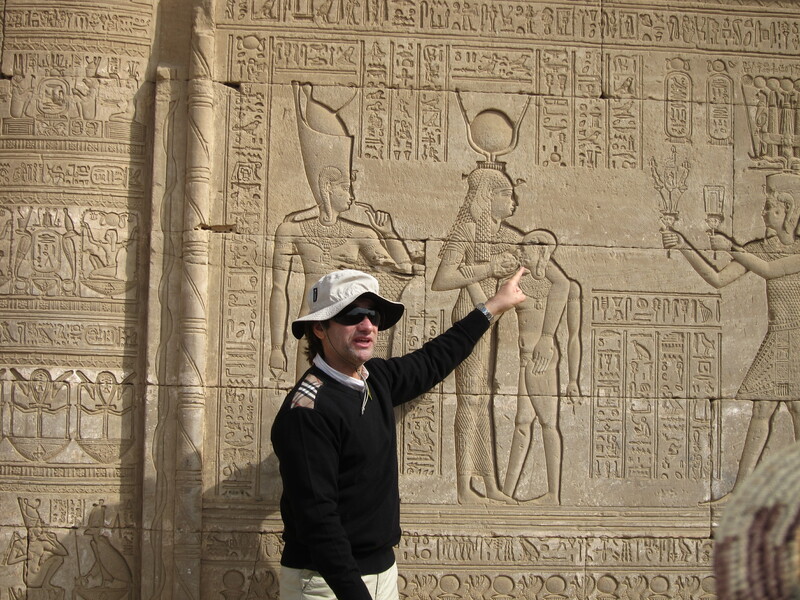 This temple was dedicated to the goddess Hathor. It was built on the foundation of a very ancient temple and had a lot of very interesting carvings, including the earliest version of the full zodiac. Even Cleopatra VII and her son Caesarian were carved on the back wall of the temple. Back on board cruising back to Luxor where we’ll end this Nile adventure with Luxor Temple. Our last temple was spectacular!!! We visited Luxor temple at night. The temple was illuminated and walking through it magical. We saw inscriptions from ancient Egypt to the time of Alexander the Great. Sphinx statues lined the pathway for up to two miles. Returned for our farewell dinner on the boat. Baked Alaska shaped like three pyramids for dessert! Great way to end the cruise. Judge the Egyptian military too harshly. You may be happy to see them someday! Wake up call at 4:45, on the road by 6 am and flight to Cairo at 7:30. The flight was much too short and before we knew it, we were back on a bus getting a tour of Old Cairo. I’ve been looking forward to this area and it did not disappoint. We drove past the City of the Dead, a seven mile stretch of mausoleums and tombs that are occupied by living as well as dead!?! First stop in Old Cairo was at the Coptic museum. So beautiful!! The building was built in the Islamic tradition with intricately carved ceilings and window coverings. It was filled with beautiful needlework, illustrated bibles and icons. The synagogue was where the Geniza documents were found. A very beautiful and well maintained synagogue, but we were saddened when Hesham told us about the ‘eviction’ of the vibrant Jewish community under Nassar. There are now only about 600 Jews left in all of Egypt. Another black mark for Nassar. We’re on our own for the rest of the day but expect to stay at the hotel as we’re exhausted!!! Back on the bus by 9 am to tour Islamic Cairo. We visited the Mosque of Sultan Hassan first. Took off our shoes at the door and walked quietly on carpeted floors into the Madrasa (Islamic school) Hesham had us sit in the sun as he explained the five pillars of Islam. We had a good discussion about what the Koran or Bible teaches and what the extremists say. Then into the inner mosque where we heard the call to prayer. Off to the Fotouh gate of the old city and into Islamic Cairo. It was Sunday so many stores were closed and the alleys quiet. The architecture was spectacular and we all enjoyed experiencing the city. Funny how we’re so comfortable now. 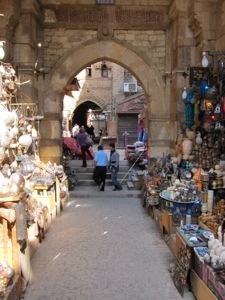 Finally arrived at Khan el Khalili, the world famous bazaar. We gathered at the restaurant made famous by the Nobel Prize winner, Naguib Mahfouz, and Hesham gave us 30 minutes to explore on our own. 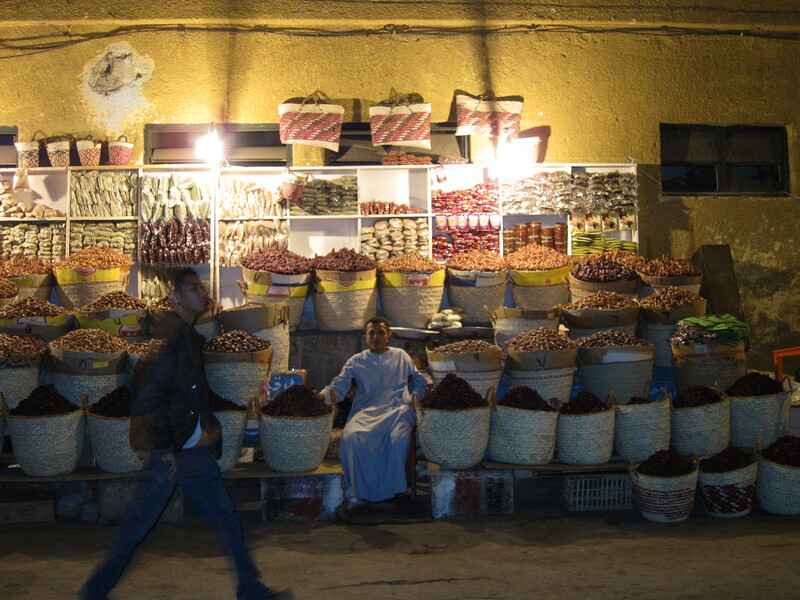 As in the Aswan Spice market, the merchants here were persistent but not obnoxious. AND we’ve gotten so good at bargaining!! Lots of fun! Back on board Hesham gave us the option of returning to the hotel or going to another shopping spot. We chose shopping!! The store was ridiculously expensive but close to the Giza pyramids so we decided to go to Mena House Oberoi for lunch. A great decision!!! Coming full circle with our last excursion in Egypt back to lunch in front of the pyramids. Mena House was originally a hunting lodge for the royal family. It is beautifully built, decorated with an abundance of gilding, and sits almost within the shadow of the great pyramid. Farewell dinner tonight at the hotel. Sad to say goodbye to everyone but we’re looking forward to getting home. Flight at 2:55 am to Frankfurt. Yikes! Be afraid to experience new cultures. Great location and over-the-top opulence! Food only OK but who cares about the food with such a view! Great to be home in the US! We have a new appreciation for the cleanliness and order of our country. This was a once-in-a-lifetime trip. We saw so many spectacular sights, met some great people, and experienced incredible adventures. Wouldn’t have missed it for the world! The countries we visited have a lot of work ahead of them. 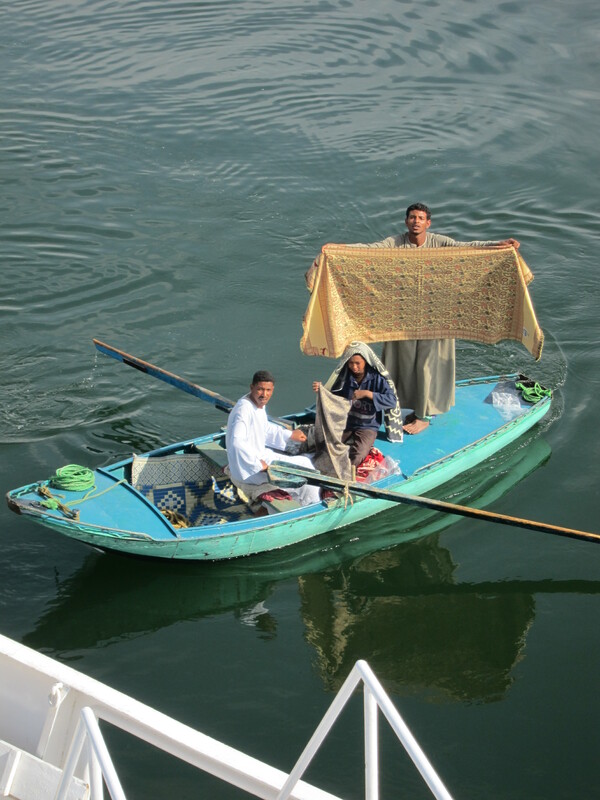 Jordan has had a huge influx of immigrants in recent years and faces serious water issues. We are confident they will work it out. We were impressed with the hospitality, national pride and warmth of the people of Jordan. Egypt’s problems are more severe. The people here were also friendly and warm, but the lack of leadership has left the country in bad shape. Not only do they need to establish a strong government but they will need to undo a lot of the mistakes from the past few years. And they need tourists back. Everywhere we went we were thanked for coming to Egypt. So many people happy to see Americans back in their country. Posted on February 20, 2012 April 19, 2019 by TravelingTullsPosted in Egypt, Jordan, Journey Egypt & Jordan, Luxury, Travel Stories, UNESCO world heritageTagged Abercrombie & Kent, archaeology, bucket list, dream destinations, luxury travel, Nile Cruise, Petra, Wadi Rum. My wife and I love to travel and Egypt and Petra in Jordan is in our bucket list. Thank you for the information and I enjoyed reading your article and the information that you have shared. Hope you’ll get there! It’s a once-in-a-lifetime trip!